How to Make Fondant Icing & Rolled Fondant. A fondant icing recipe and a rolled fondant recipe. If your looking for a fondant recipe or just plain curious on how to make fondant, here are a couple of recipes I've found for two kinds of fondant depending on your needs. A fondant icing recipe and a rolled fondant recipe. The two are quite different and used for different purposes. Fondant icing is used to glaze petit four frais. It is kneaded then flavoured and coloured as desired. You can roll it out, cut and dip in chocolate or roll and dip in garnishes or chocolate. Rolled fondant can be rolled over a large work surface and placed over cakes and fruitcakes and coloured fondant is often shaped to make fondant flowers. If you're not experienced with working with fondant, experiment with the recipes to see where they lead you. Making fondant is a little like playing with playdough. 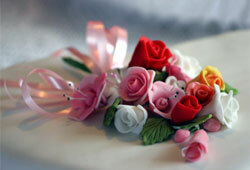 Fondant making can be fun and fondant frosting can be a new artform - especially if you are new to it. If you're planning to make your own wedding cake, both these fondant recipes may come in handy. 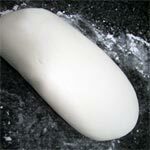 This Fondant icing is used to glaze petit four frais. It can be flavored and coloured. Knead then flavour and colour as desired, roll out, cut and dip in chocolate or roll and dip in garnishes or in chocolate. Prep: Sprinkle a large slab of marble or a large, heavy, smooth surfaced baking sheet with cold water. Over medium heat, stir very gently sugar, water and glucose in heavy saucepan until the sugar has dissolved. Increase temperature and bring to boil. Cover pot and boil for three minutes. Remove lid and place in candy thermometer. Continue to boil until the temperature reaches 240°F, soft ball stage. Remove from heat and immediately dip the bottom into cold water to stop cooking. Pour this hot syrup onto the prepared marble and leave to cool for a couple of minutes. Using a damp metal spatula or metal scraper, lift the edges of the syrup and fold back into the center. Keep doing this until the mixture turns glossy, and is pale yellow in color. Then use a heavy wooden spoon to work the mixture in a continous figure eight for about 5 to 10 mintues. Keep doing this action until the mixture turns white, is crumbly and stirring with the spoon is extremely difficult. Moisten hands and knead the fondant for about 5 to 10 minutes, or until the mixture feels moist and is perfectly free of lumps. Use the metal scraper to lift the fondant if it sticks to the surface. Form the fondant into a ball and place in on a moistened plate. Cover with damp cloth, and leave it in a cool place for 12 hours to ripen. Dust your work surface with sifted powdered sugar, and place the fondant on that. Press it out flat. If coloring, make slits in the fondant and drop the colouring into those slits. Knead well and use as desired. 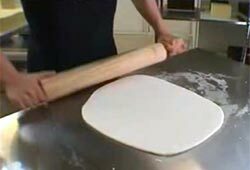 Rolled fondant is the fondant that can be rolled over a large work surface and placed over cakes and fruitcakes. It can be shaped and can be coloured. Sprinkle gelatin over water in small saucepan. Let sit for 5 minutes, then over low heat stirring frequently, stir to dissolve gelatin. Cover saucepan to keep warm. Place the sugar in a large bowl and make a well in the center. Add corn syrup and glycerine; do not mix in. Pour the warmed, dissolved gelatin into the well over the top and mix in with a lightly oiled rubber spatula or wooden spoon. Mix until the dough is too stiff to stir. Because the dough will be very sticky, oil hands with a small amount of oil. Knead dough until of the sugar is incorporated. Transfer to a lightly oiled surface and continue to knead until smooth and satiny. This will be the texture of clay. If the fondant is too dry, add in a few drops of water and if it is too dry, add in a bit of powdered sugar. Shape the fondant into a ball, flatten slightly and wrap well in plastic wrap. Let rest for 20 minutes before rolling and using. If you're making a fondant wedding cake, either fondant recipe will be suitable. The fondant icing recipe is perfect for sculpting and decorating with fondant, while the rolled fondant recipe is perfect to cover the wedding cake. Now we all know how to make fondant, don't we? Hirsheimer, Christopher. Saveur. "Fruitcake Weather: 'Tis the season for a taste of memory, intimacy, and pure sensual pleasure." Nov./Dec. issue, 1996. No. 15. P.124.